Real Earth Products shares your passion for the outdoors. We formulate organic plant extracts, exotic oils, butter and beeswax into balms, insect repellents and other personal care products for outdoor enthusiasts, explorers, and adventurers. We hope you enjoy our products as much as we do, and please contact us with any questions or comments. Whatever path you choose, we hope to help you along the way. The stuff you want. The stuff you need! 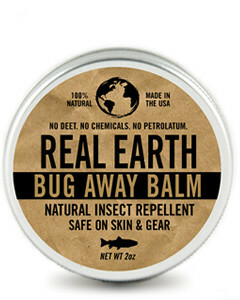 Same great insect repellent properties as our famous Bug Away Spray but in a easy-to-use, easy-to-pack balm. All-Natural and 100% Organic formula contains no DEET, petrolatum or other chemicals. Use when CAMPING, FISHING, HUNTING, HIKING, BIKING, GARDENING, CLIMBING. Fresh smelling protection that can be used by the whole family. Convenient and packable 2.0 ounce tin. Safe for pregnant women, children and pets—Great smelling fresh scent! Use when CAMPING, FISHING, HUNTING, HIKING, BIKING, GARDENING, CLMBING. Convenient 2.0 oz (travel size) or 4.0 oz pump spray. 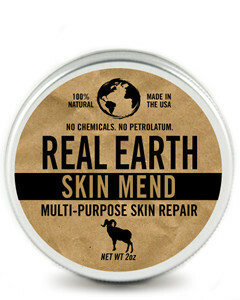 A 100% all-natural, skin repair system that moisturizes, repairs, protects and heals dry, chapped and damaged skin. Great for cuts, scrapes, rashes, cracked cuticles and abrasions. Use when CLIMBING, SKIING, CAMPING, FISHING, HUNTING, HIKING, BIKING. Easy to pack. and it works—big time.